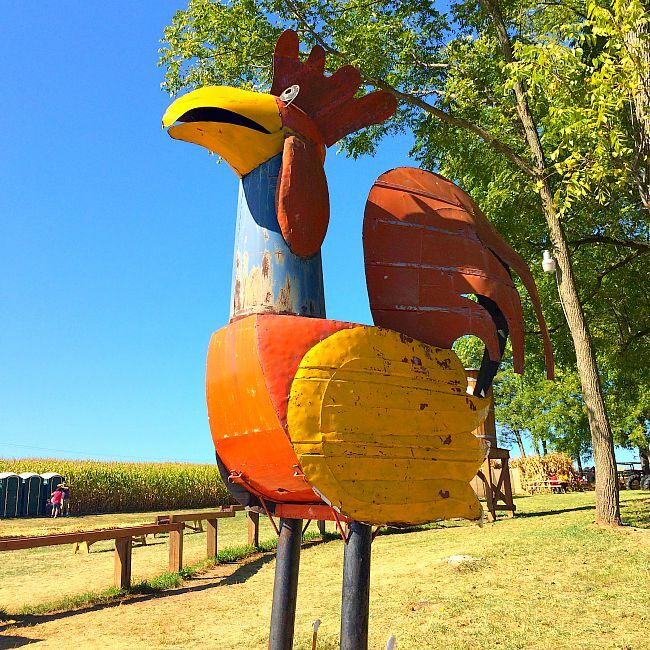 10 Reasons Why the Gaver Farm Fall Festival Really Packs in the Fun! 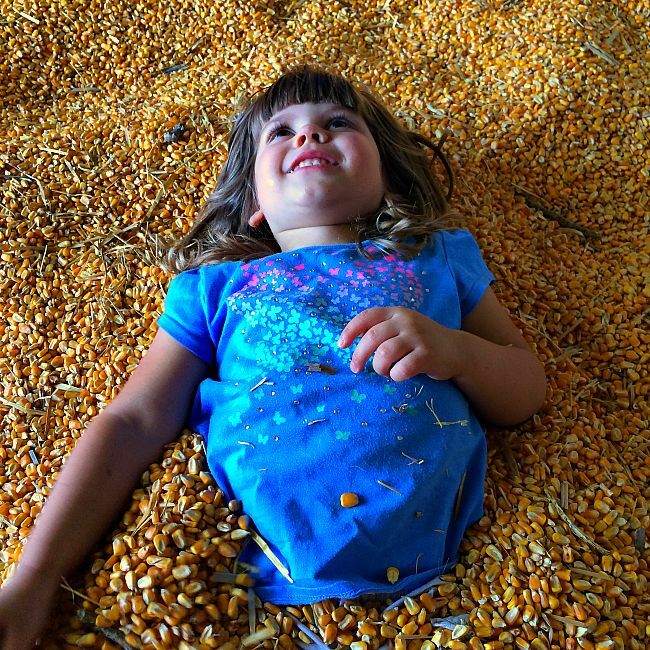 The fall season has always been fun… but when did it get totally amazing? When did brilliant farmers decide to open their fields up for the country version of an amusement park every September and October? I never remember anything like this when I was growing up. 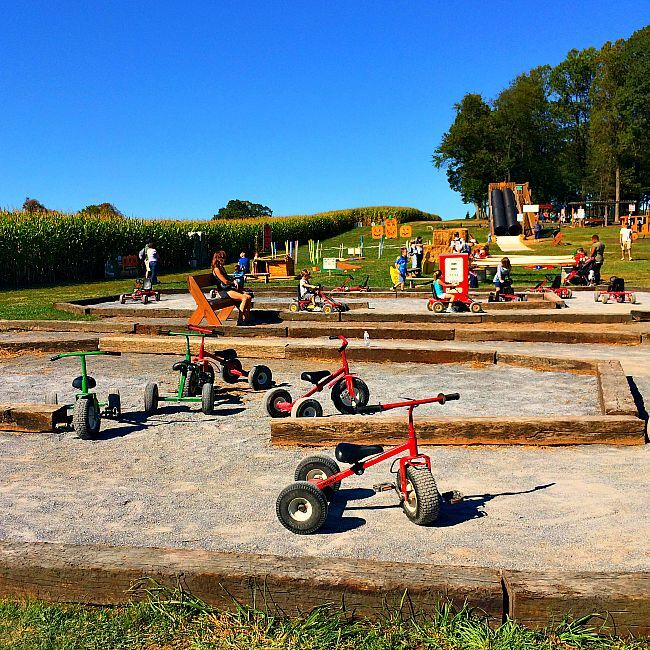 I mean, when I was a kid fall fun festivals like the one at Gaver Farm in Mount Airy just didn’t exist. However, now it seems that no childhood would be complete without an annual trek to a fall fun festival. 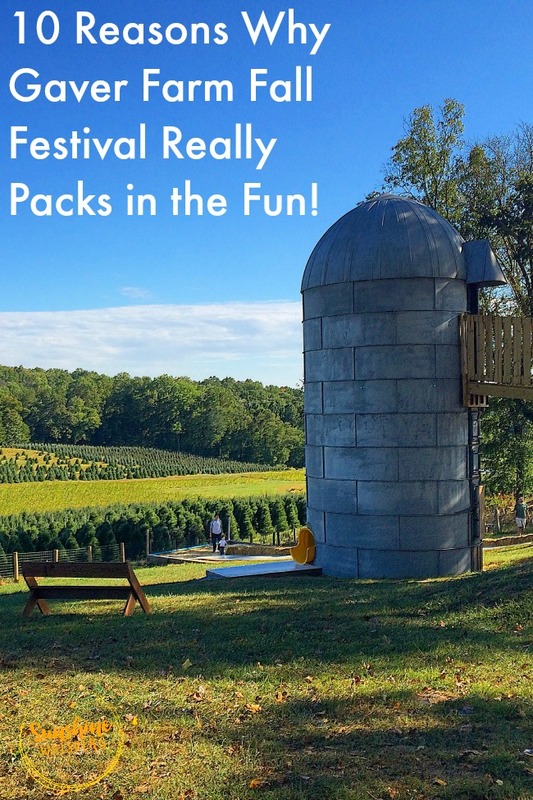 The Gaver Farm Fall Fun Festival is definitely a fantastic experience and should be near the top of any family’s list of Fall Festivals in the Maryland-DC area. 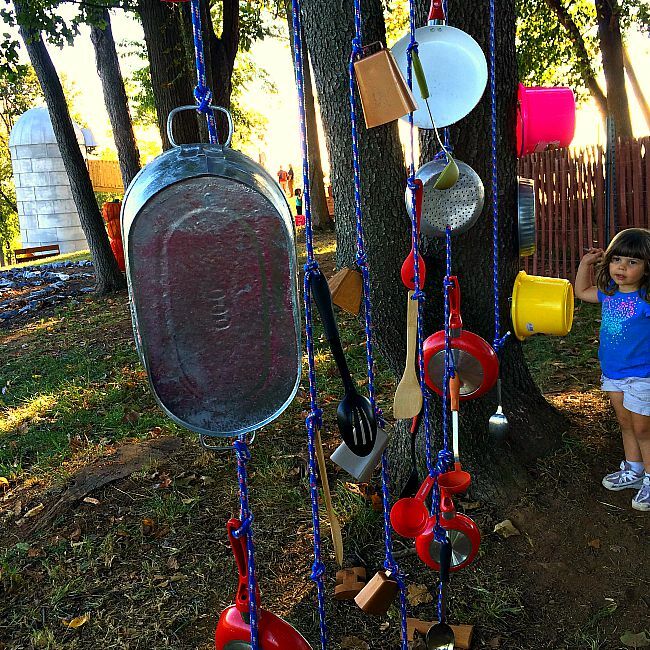 10 Reasons Why Gaver Farm is Really Loads of Fun! 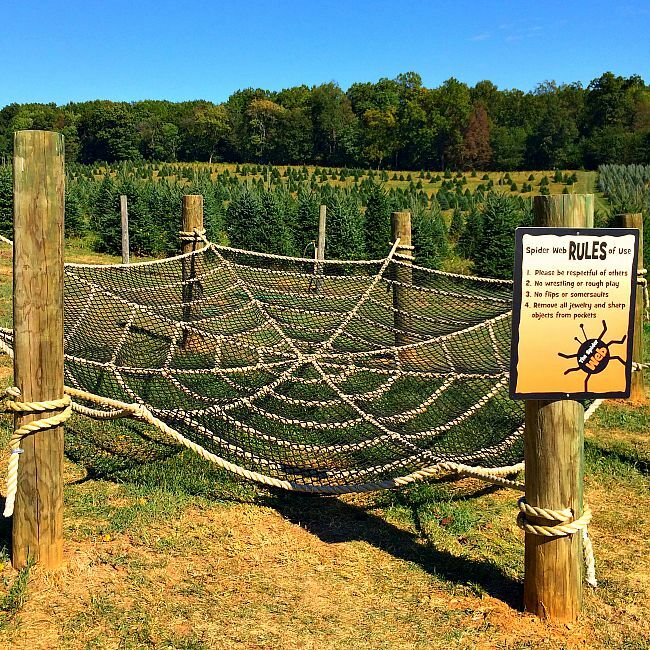 Gaver Farm in Mount Airy, MD is a serious about ensuring you and your kids have a blast on their farm. 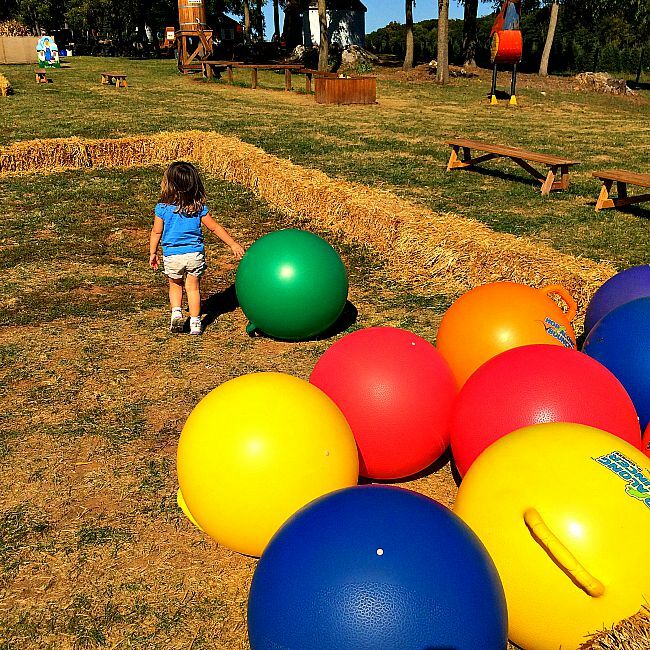 Every year, the Gaver family plans a huge list of fun activities that are suitable for a wide range of ages, from toddler through adult. 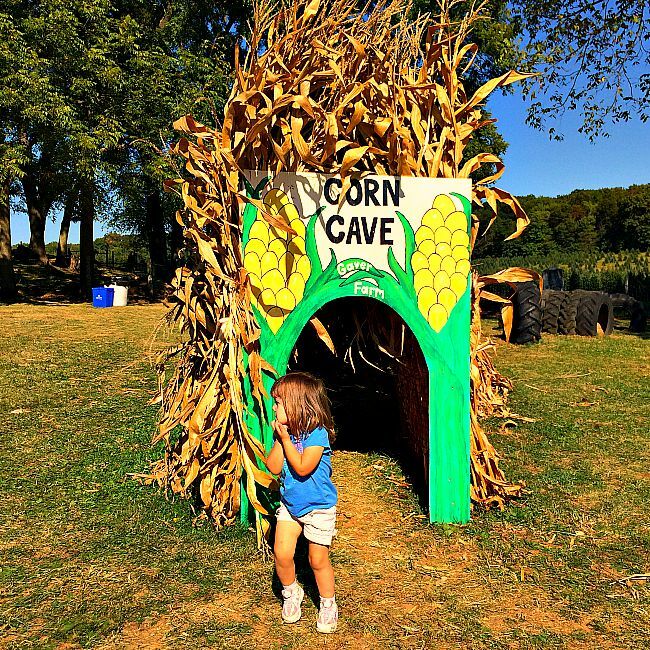 According to their website, the Fall Fun Festival boasts over 45 attractions, including a huge corn maze. I have to tell you, my daughter and I could have easily spent all day here. There were at least 10 attractions that held her attention for more than 10 minutes. I literally had to peel her away from many of the activities just so we would have time to see everything. 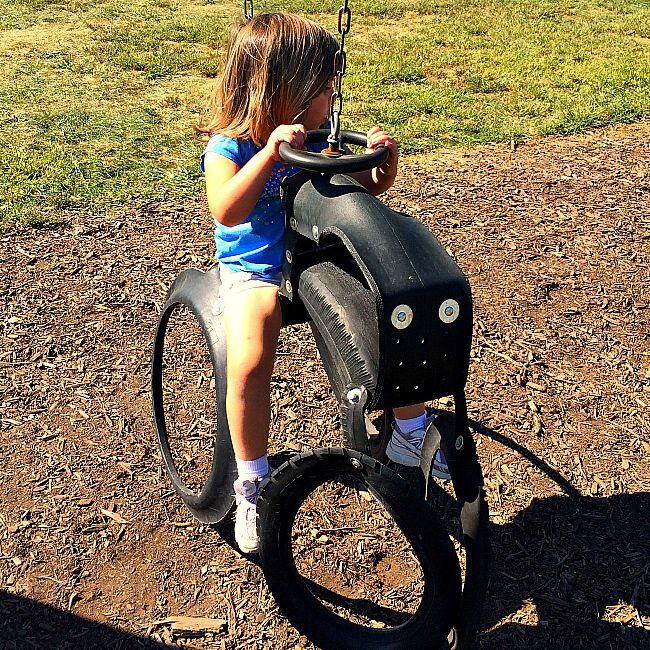 As a Mom of an active kid, I have to tell you– that is an awesome problem to have! The fun starts the moment you pay the admission fee. A huge jumping pillow is the first attraction you will encounter. We were fortunate that there were only a handful of fellow ‘bouncers’ on the pillow with us. I can imagine that the pillow could get crowded (and dangerous) if more than about 15-20 people bounced at the same time. We did have a blast though! Sweet Pea had a blast in the two (yep, two) corn cribs on the premises. In the first one, we dug for buried treasure.. which turned out to be her! In the second one, she spent a good chunk of time filling up dump trucks with corn. 3. So many super fun slides! 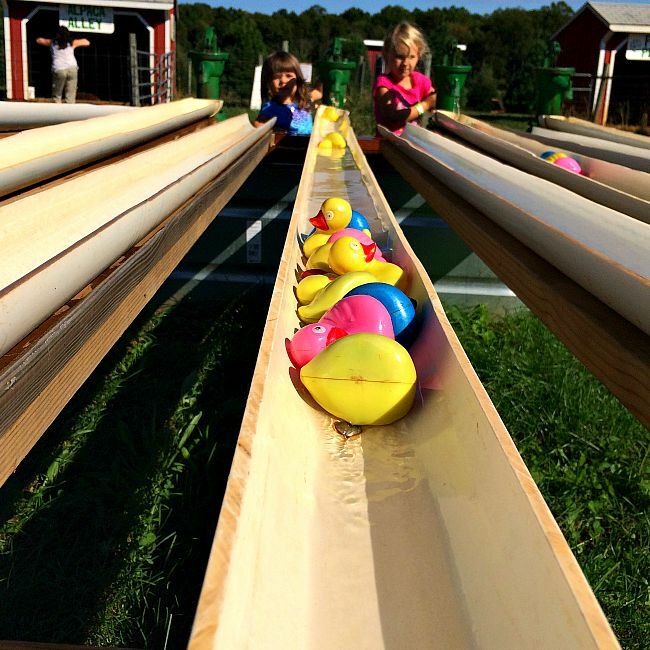 There are many, many slides at Gaver Farm. There are hill slides, silo slides, tube slides, and everything in between. 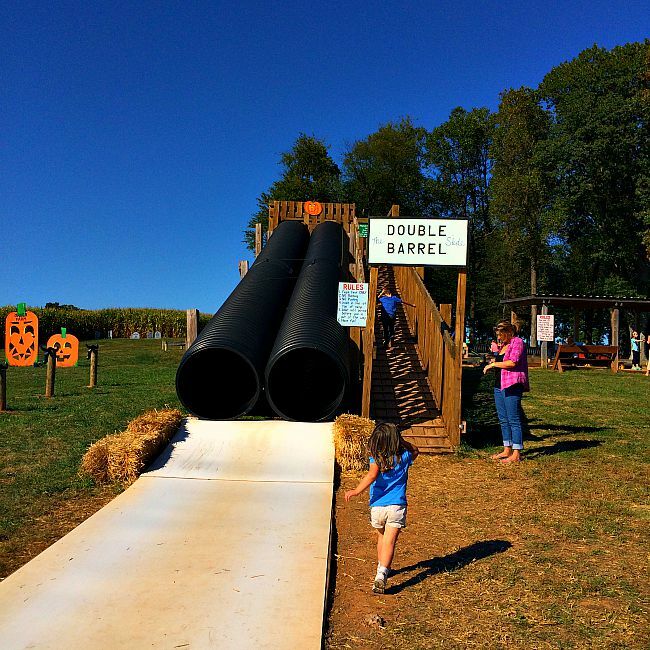 The double barrel tube slide was a huge hit. 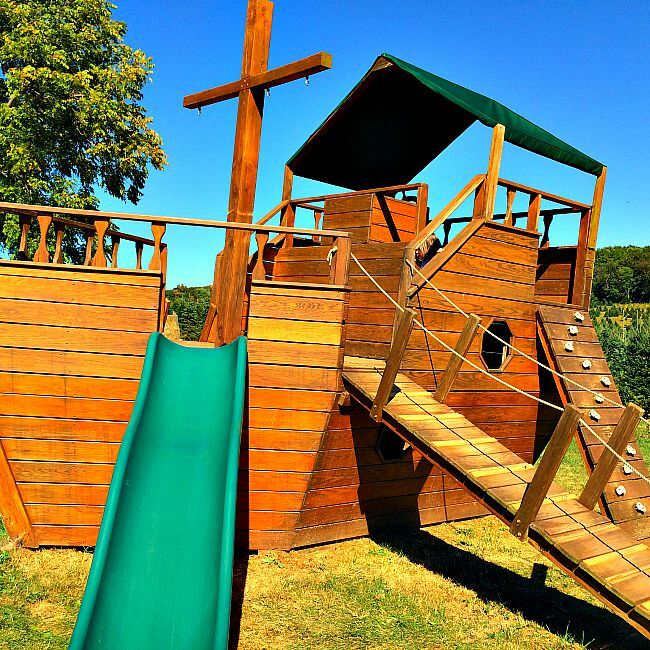 Every time my daughter slid down, you could hear her scream with delight. 4. 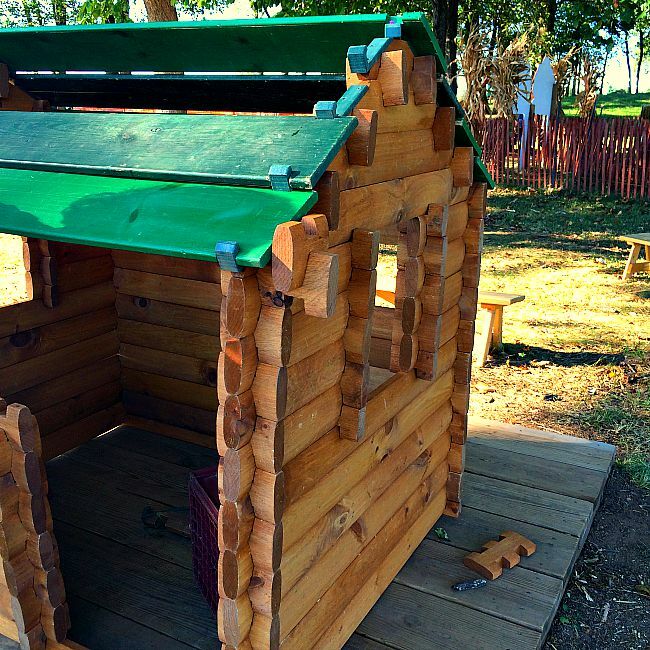 Tons of smaller play structures for kids of all ages. 5. 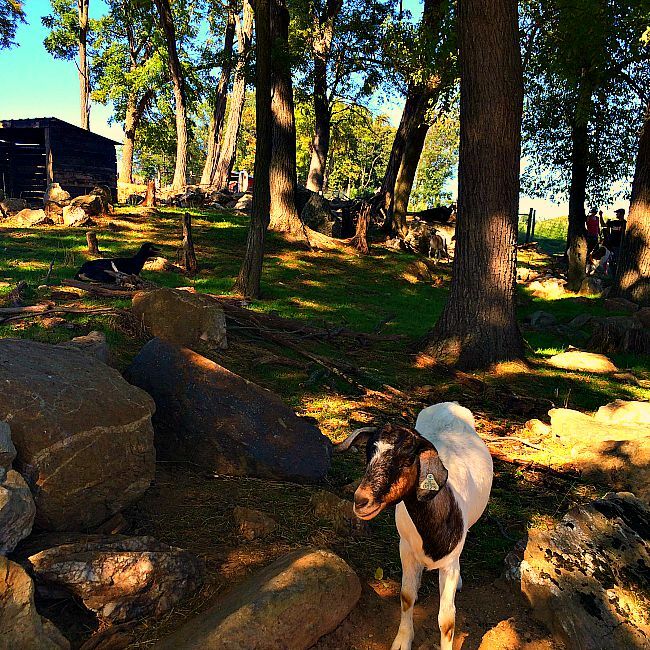 Farm animals and goat feeding! The Fall Fun Festival includes a rather large petting farm area. I particularly liked the goat area because it was shaded and very pretty actually. For $2.50 you can buy a big cup of feed for the goats, ducks, alpacas, rabbits, and many other animals that are on the farm. It is really cute (most cow trains are though). There are two cow barrels side-by-side. This makes it really easy for Mom or Dad to ride along. The cow train ride goes through the Gaver Farm Christmas Tree fields. This ride is totally gorgeous! 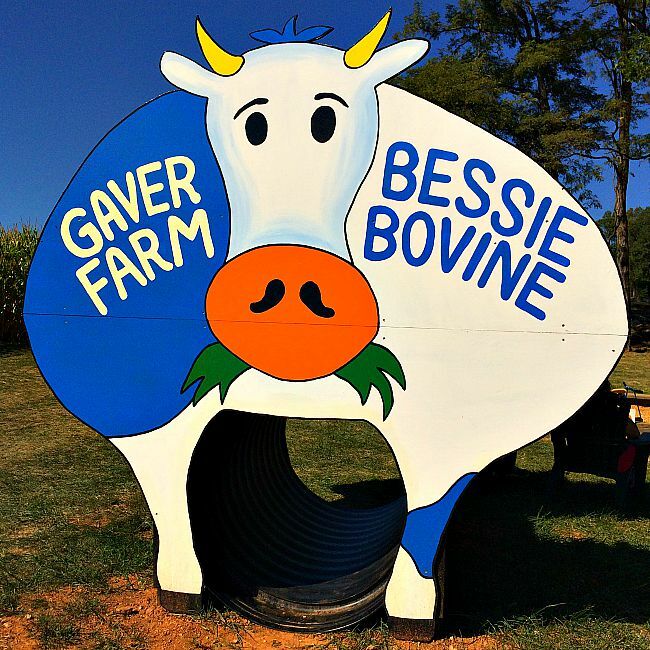 Actually, all of Gaver Farm is gorgeous. That is one of the things I think I love the most about this particular fall festival. Yes, the attractions are concentrated on the side of the hill. 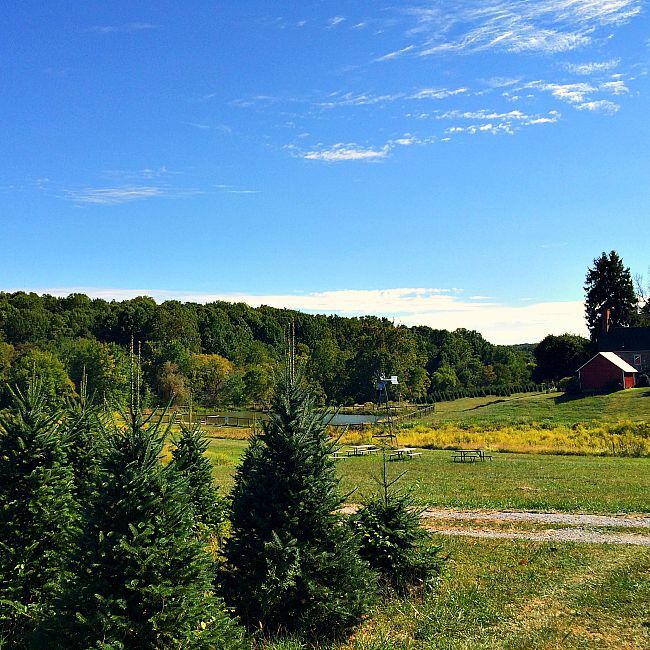 However, there are numerous sweeping vistas of the Christmas tree farms, pumpkin patches, and surrounding farm land. It is really beautiful and totally peaceful. Well, that is until your three-year old screams down the slide for the 15th time. Ha! 8. 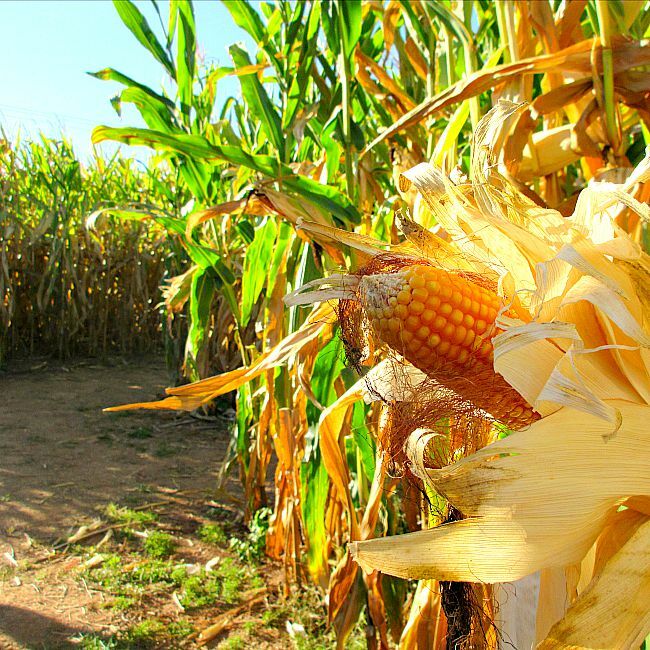 Corn Mazes for all ages too! 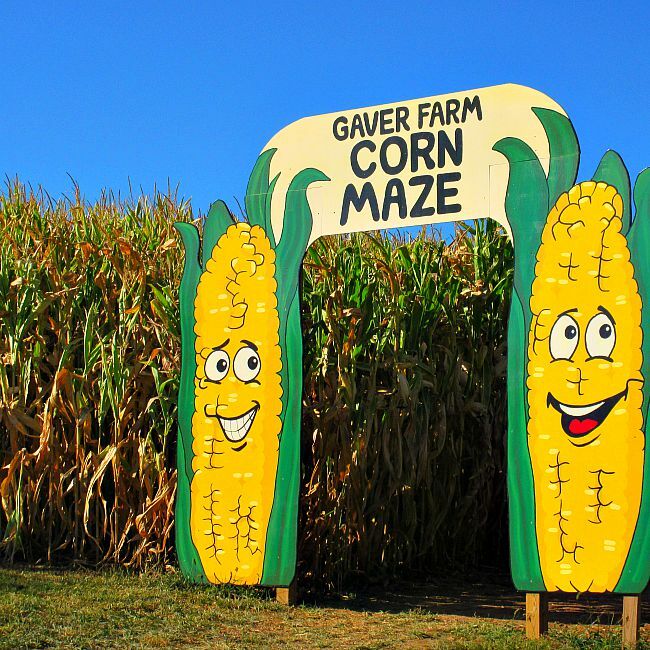 Every year, the Gaver family sets out to create a fantastic corn maze you can spend a few hours getting lost in. This year is no different. Since there was no way I was prepared to spend a few hours in a corn maze with a 3-year old, we chose the much smaller Kiddie Maze adjacent to the large maze. We got just lost enough that it was a perfect adventure for a preschooler. It took us about 10 to 15 minutes to figure it out. 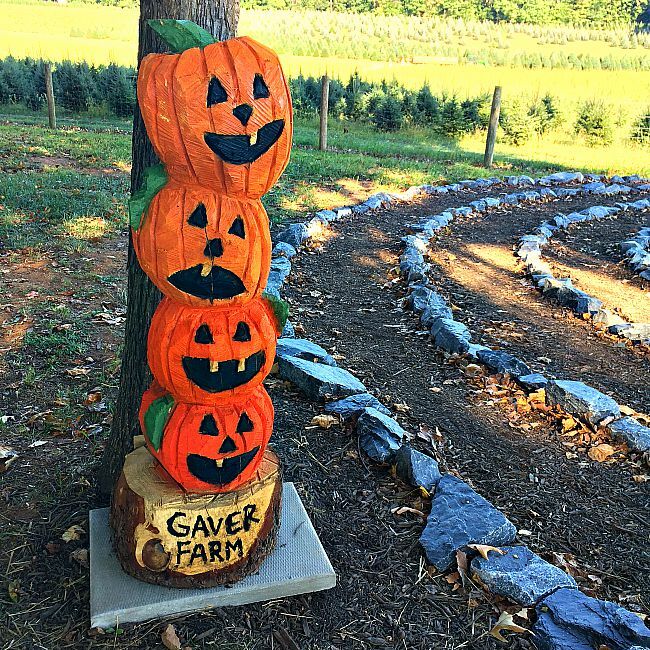 Then, of course Gaver Farm is a great place for pumpkins. 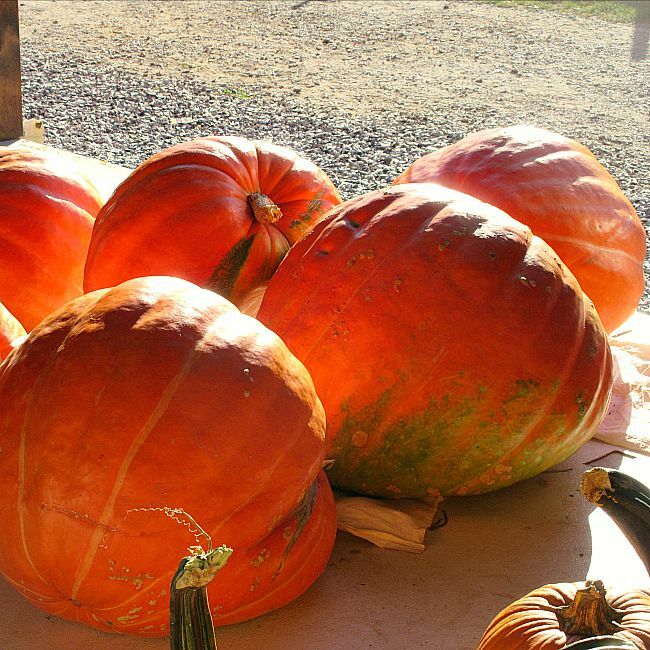 If you just want to pick pumpkins, the hayride out to the pumpkin patch is free. 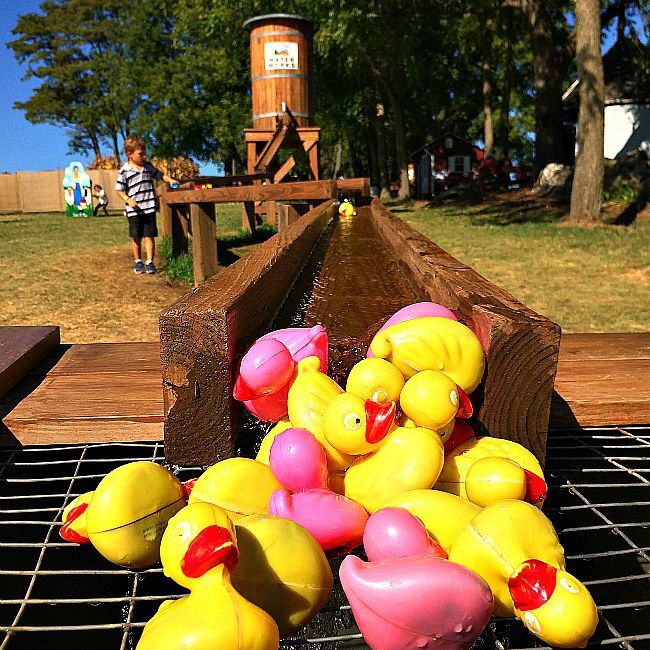 It is also included in the admission fee for the fall fun festival. 10. Yummy Treats… really yummy treats. 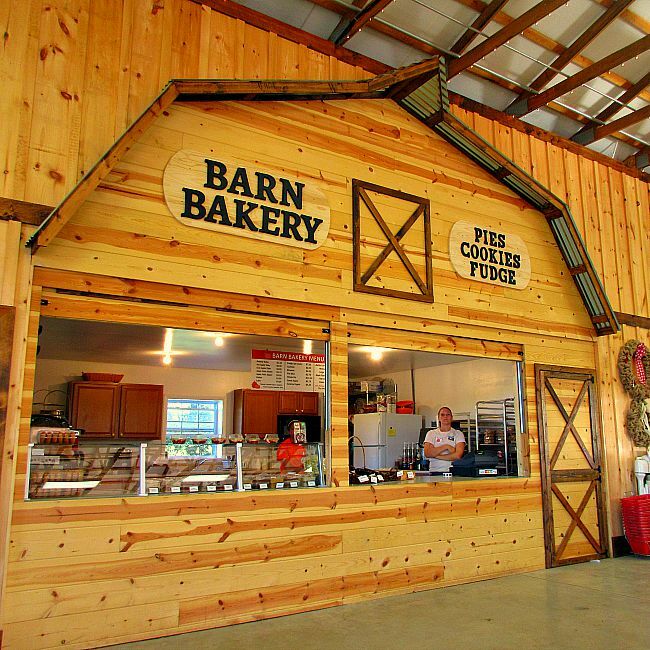 Once you have had your fill of festival fun, you just have to top off at the main barn. We indulged in fresh cider donuts, cider slushies, and homemade fudge. 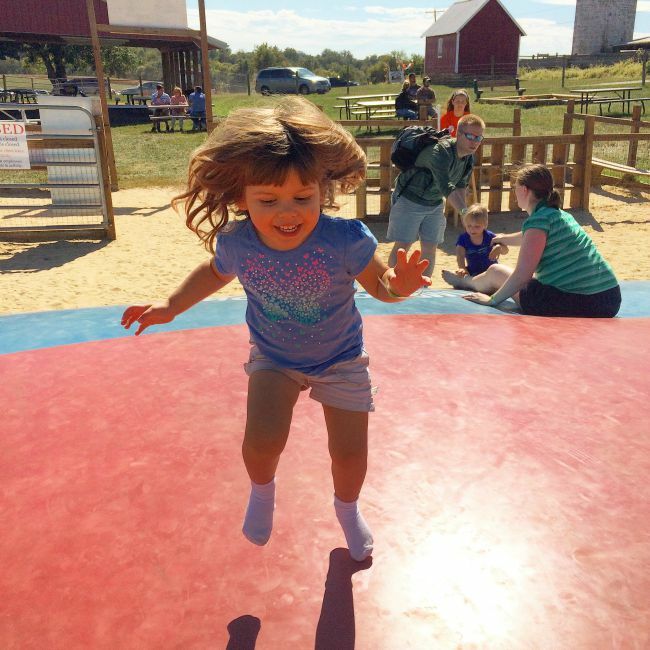 Fall Fun Festival admission is $7.75 per person (weekdays) and $11.00 per person (weekends). Children 2 and under are FREE. Season passes are $32.50 per person. The Fall Fun Festival is open and fully operational every day from 10AM-6PM until November 5th. That means, you do not have to brave this festival on the weekend with the hordes of humanity. Seriously, if you stay home with your kids you should consider checking out this festival during the week. If you work outside the home, I would seriously consider taking some time off to take your kids to the festival during the week. I can only imagine this festival is super busy on weekends in October. Gaver Farm doesn’t just offer pumpkin picking. The Apple Harvest Festival kicks off apple picking season. Apple picking is available on weekends in October. 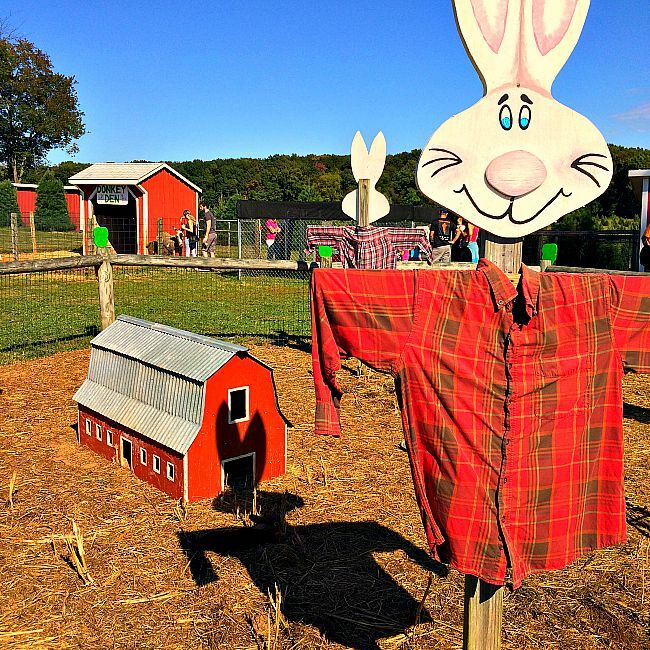 Like the pumpkin picking, the hayride out to the orchard is free and as long as you purchase an apple picking bag ($20 per peck), admission to the orchard is also free. 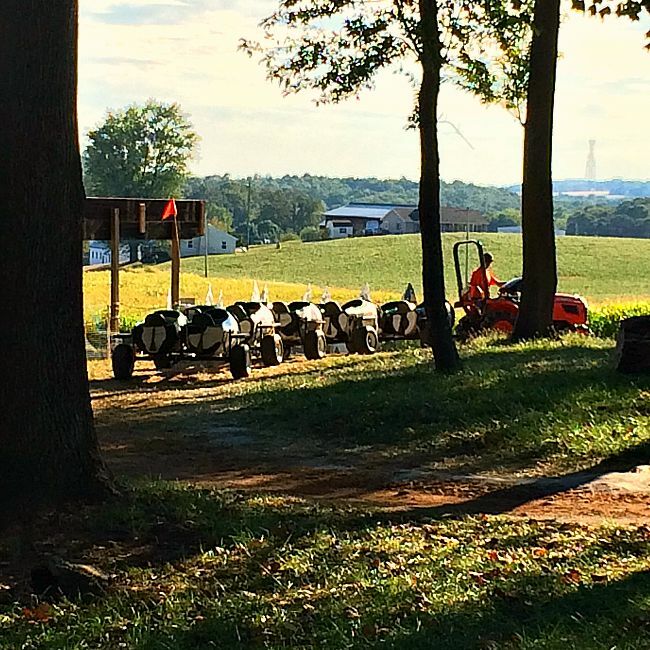 Every Saturday night in October the farm offers evening activities, including the moonlight version of the corn maze, campfire, and smores. Evenings at Gaver Farm are not ‘haunted’ so it is definitely friendly for families with young children. Thanks for reading and have some great fall festival fun! Previous Post: « So Divine, Shimmer and Shine Slime! So excited I just found this website! I am looking for fall activities ? Hi Veronica! I am so excited that you got some great ideas from my site! Welcome! What types of fall activities are you most interested in? Anything fall related! From watching the leaves change colors to visiting farms for apples cider and pumpkins. I love this time of year through Christmas. After Christmas I’m ready for the beach haha!